Shirley LeFlore '76 was selected to be St. Louis City's poet laureate. ST LOUIS - Poetry is a powerful art form that can illuminate the issues of the day, broaden viewpoints and generate inclusion and a respect for diversity, educator Bertha Rogers wrote last year. Now two Webster alumni will use their poetry to share those same values and spur discussions about the human condition with the City of St. Louis. Artists Shirley LeFlore ‘76 and Jane Ellen Ibur ’73 were appointed as St. Louis’ poet laureate. LeFlore was sworn in at a CityHall ceremony in early November and will serve until April. Ibur will then take over and serve a two-year term. They will be the second and third poet laureates in the city’s history. As poet laureates, they are officially tasked with promoting poetry and art in the community, but the purpose of the poet laureate is much more expansive. The first poet laureate was created in Britain in 1616 and the position was adopted in the United States in 1937. According to U.S. law, the poet laureate is tasked with “raising the national consciousness through poetry.” Some of the more famous poet laureates in history include Lord Alfred Tennyson and Robert Frost, both who used their art forms to capture the national moods at the time. The position of poet laureate in the City of St. Louis was created in 2014 by the St. Louis Board of Alderman. Michael Castro was the appointed to the position in 2015 and served as poet laureate until May of 2017. Ibur was selected to replace Castro in December 2016, but the appointment was delayed. This summer a new task force also recommended her appointment, and the Board of Alderman reaffirmed that nomination in October, with her term starting in April, 2019 – National Poetry Month. Ibur and LeFlore are not the first poet laureates associated with Webster University. David Clewell, professor of English and creative writing in the College of Arts & Sciences, served as poet laureate of the State of Missouri from 2010-12. LeFlore graduated from Webster University with a degree in social science. Before she attended Webster, she performed with the famed Black Artist Group (BAG) and is one of only a few surviving original BAG members. 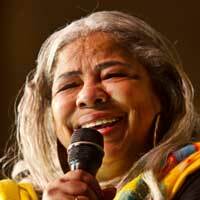 She has performed all over the world including touring Europe as a featured artist with late R&B legend Fontella Bass. After graduation, she taught artists in various school districts and educational programs throughout St. Louis City and St. Louis County and served as an assistant dean of students at Webster University. 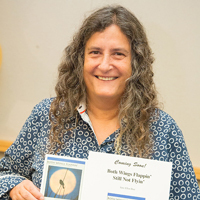 She has been published in numerous anthologies and magazines, wrote the play “Rivers of Women” and published “Brassbones & Rainbows,” a collection of her poems. LeFlore also is mentioned in Webster alumna and “Black-ish” television star Jenifer Lewis’ autobiography “The Mother of Black Hollywood: A Memoir” as a person whose work had a profound influence on her outlook. One of LeFlore’s poems can be found in the online magazine River Styx. Ibur has taught and led workshops for other teachers through Literacy Investment for Tomorrow (LIFT), a public-private literacy resource organization, and through the RAC-funded Community Arts Training (CAT) Institute, which trains artists and social workers to form nontraditional partnerships to “put art in other places” — places such as public housing, parks, neighborhood centers and jails, where art can make a changing social impact. Three of Ibur’s poems can be found online in the American Journal of Poetry.